Organizer: MMU BAU Fenestration Co., Ltd.
BAU Congress China is an annual congress that focuses on high-quality design, planning and construction. 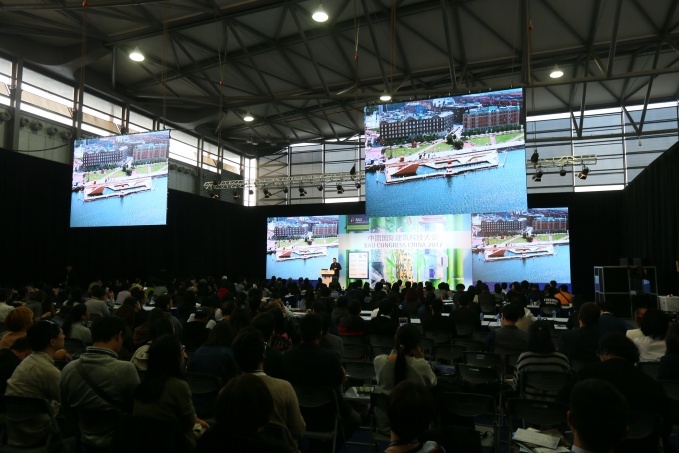 The congress and its highly reputed speakers allows participants to experience best-practice examples and insights on structured, long-term and sustainable urban development. BAU Congress China is tailored to the developing needs of the Chinese market. It supports the building industry of China to solve the problems faced such as construction quality, energy efficiency, sustainability, urban renewal, and provide new ideas. It is the place to be for all industry specialists. critical, demanding and unbiased manner about contemporary architecture in Europe and around the world. Boris Schade-Bünsow has been editor-in-chief of Bauwelt since March 2011. Kjetil Thorsen spent most of his childhood on the coastal island of Karmøy, Norway. After completing his first three years of school in Essen, Germany, he moved back to Karmøy. Before finishing his sec-ondary education in Norway, Thorsen spent two years in Sunningdale, England, where he completed his art O level a year early. Thorsen moved to Graz, Austria, to study architecture and became a certi-fied engineer in architecture in 1985. That same year, he moved to Oslo and started his first private architecture practice. In 1989 he co-founded Snøhetta – a collaboration of architects and landscape architects. He also co-founded Galleri ROM, Norway’s first architectural gallery. Since the creation of Snøhetta, Thorsen has been a driving partner and, as a board member and project director, has been instrumental in defining and developing Snøhetta’s philosophy and architectural ambition. Many of the projects created by Snøhetta have been inspired or led by Thorsen. Beyond the concepts of Smart Cities and technological advances lies what is perhaps one of the most stable concepts of modern societies: humanism. Ever since Snøhetta was established almost 30 years ago, the firm’s commitment to humanism and generous design has remained the same. By digging into key projects that have defined Snøhetta over the last three decades, Founding Partner Kjetil Trædal Thorsen explores how cultural buildings, urban landscapes and the necessary blur of the distinction between private and public space can help shape a more holistic understanding of the cities of tomorrow. 2017 Busan Architectural Culture Festival (South Korea) and recently curated the Chinese Pavilion at the 2018 Venice Biennale. Liu Wan is a member of the Urban Design Academic Committee of UPSC (Urban Planning Society of China), the Urban Regeneration Academic Committee of UPSC, the Urban Design Council of ASC (Architectural Society of China), and the New Urbanization and Urban Planning Committee of CSUS (Chinese Society for Urban Studies). She is director of the Editorial Department of the Journal of Urban and Regional Planning and member of the Editorial Board of the journal Urban Design. Liu Wan’s research focuses on urban design and historic preservation and she has published more than 60 papers and books. In addition, as a national registered urban planner, she has been involved in many planning and design schemes and research projects. With the development of Chinese cities from extension to connotation, the pursuit of high-quality urban space has become the common goal of Chinese urban managers and urban designers. After decades of exploration in urban construction, urban design has become the focus of attention of the whole society. Reviewing the typical phenomena of urban design practice in China in recent years, the lecture illustrates the promotion of Chinese urban design on all aspects, from theory, method, practice to institutionalising. Urban design in China has entered an important period of practice and become a means of urban governance. Philip F. YUAN is an academic researcher and architect who focuses on computational design and digital fabrication. Yuan is now acting as the Council Member of Architects Sector, Architectural Soci-ety of China; Council Member of Digital Fabrication Sector, Architectural Society of China; as well as the Director of Academic Committee of the Shanghai Digital Fabrication Engineering Technology Cen-ter. As the organiser of the Shanghai DigitalFUTURES series event, Yuan has been strongly promot-ing computational design and digital fabrication since 2011. Yuan is currently pursuing integration be-tween architecture and cross-disciplinary digital design methodologies. He has been awarded a vari-ety of prizes including Honorable mentioned by Plan Award 2018, The International Architecture Award (IAA) 2018, 2016 Gold and Silver Prize of Architectural Design of Architectural Society of China, etc. Philip F. Yuan has published more than 170 articles in academic architectural journals and magazines and ten books including Collaborative Laboratory, Digital Fabrication, Computational Design and From Diagrammatic Thinking to Digital Fabrication. Technical University of Munich (TUM) from 2003 to 2004. In 2011 he founded his own architectural firm SUP Atelier in Beijing. Professor Brian Cody is university professor at Graz University of Technology and head of the Institute of Buildings and Energy. His focus in research, teaching and practice is on maximising the energy per-formance of buildings and cities. Before his appointment at Graz University of Technology he was as-sociate director of the international engineering consultancy Arup. He is founder and CEO of the con-sulting firm Energy Design Cody, which is responsible for the development of innovative energy and climate control concepts on construction projects all over the world. Professor Cody serves as mem-ber on many advisory boards and juries and is Visiting Professor and Head of the Energy Design Unit at the University of Applied Arts in Vienna. He is author of the book ‘Form Follows Energy’ published in 2017. Designing with the parameter of energy to create new forms in architecture and urban design. Combining technology with natural forces to create high-performance smart buildings, which achieve more with less. The virtual dimension of sustainability and the possible consequences for the physical environment. Satoshi Ohashi has worked and collaborated closely with Zaha Hadid since 1987, working in New York, London, Paris and Tokyo and now currently the Director at Zaha Hadid Architects (ZHA) Asia Region in Beijing. ZHA is a British international architecture and design firm found¬ed by Zaha Hadid in 1980, with the main office in London, and now with offices in Beijing, New York, Hong Kong, Dubai and Mexico City. The practice is known internationally for dynamic and innovative projects which build on Hadid’s revolutionary exploration and research in the interrelated fields of urbanism, architecture and design. Over four decades of practice and research, the firm has created a unique aesthetic that is unclassifiable and yet instantly recognisable for its clarity of vision. Recent projects that respond to specific contemporary conditions creating smart, sustainable, sensory planning strategies. Gunnar Grün studied civil engineering at the University of Stuttgart (Germany) and the University of Calgary (Canada), graduating in 2005. He then concentrated on his doctor’s degree in civil engineer- ing at the University of Stuttgart in cooperation with the Fraunhofer Institute for Building Physics (IBP), which he completed in 2008. At the same time he worked as a scientist at Fraunhofer IBP. After com- pleting his doctorate, he worked in the early years as group manager indoor climate systems at Fraun- hofer IBP. In 2011 he became head of the indoor climate department and in 2015 head of the energy efficiency and indoor climate department. Since 2016 he has been deputy director of Fraunhofer IBP. In addition to his work at the Fraunhofer Institute, he was lecturer at the Technical University of Mu- nich (TUM) from 2010 to 2014 for the master’s course indoor climate and comfort at the chair of build- ing physics. Grün has been professor for system integration efficient buildings at Technische Hochschule Nürnberg Georg Simon Ohm, Department of Mechanical Engineering and Building Ser- vices Engineering, since 2015. Along with societal development worldwide, our cities face the challenges that accompany significant growth: in population, urban construction, mobility, trade and production, as well as the associated consumption of resources and energy. We strive to shape sustainable cities that offer prospects for their citizens for generations. One of the key issues for future sustainable cities is the effective and efficient supply, distribution and use of energy. As part of the German effort towards the transition to a carbon-neutral energy system, the energy concepts of cities and municipalities play a key role. Insights will be provided into two award-winning contributions of the energy-efficient communities competition launched by the German Federal Ministry of Education and Research (BMBF). Furthermore, there follows a discussion of the principles and examples of energy-generating buildings – the Efficiency Houses Plus – initiated by the German Federal Ministry of the Interior, Building and Community (BMI) and evaluated by Fraunhofer IBP. TUBSEU will participate in the Solar Decathlon China 2018. TUBSEU stands for the Technische Uni-versität Braunschweig (TUBS), Germany, and Southeast University (SEU), China. The letter S con-nects both universities, just as solar innovation connects TUBSEU to the competition. Representatives of both universities work together closely to unite their collective wisdom, integrate innovation, over-come cultural barriers, and focus on current consumption patterns to design and build a flexible, pre-fabricated, smart, low-carbon and comfortable solar-powered houses. TUBSEU comprises professors and students from different disciplines, including architecture, civil engineering, energy and environ-mental studies and materials studies. The team’s main faculty advisors are Professor Zhang Hong, Director of the Department of Building Science and Technology, School of Architecture, SEU, and Pro-fessor Norbert Fisch, Director of the Institute of Architectural Services and Energy Design at the TUBS. Together the team has developed the so-called C-house for the Solar Decathlon China. The name ‘C-house’ comes from the basic design concept of a compact cube and an integrated core. The C-house core integrates all service spaces and increases the usable area by 30 per cent in the com-pact cube. More than 70 per cent of the energy consumption in the building is concentrated in the con-struction phase, which is what they call body energy. The design and management of the entire life cycle allows the C-house structure to be disassembled and assembled at an ultra-high speed. This facilitates a reduction in carbon emissions and a real life cycle. This is one of their important energy saving strategy. The aim of sunshine 2.0 is the concept of building, performance and humanities inte-gration, which is embodied in C-house. This next generation architectural design will raise the level, forcing us to pay attention not only to architectural design but also to construction and performance control levels. 1. Using the information technology of BIM, the assembly of the C-house was completed efficiently in 20 days. 2. The performance requirements of the C-house were met and exceeded the specifications of the competition. 3. How to realise BIPV in line with future developments. (2012) in Syracuse University and the Visiting Critic (2010) in the National University of Singapore. He has also taught joint-studio projects in a number of institutions, including GSD, Harvard; Barcelona School of Architecture, UPC; Berlage Institute. Zhang Li has been a keynote speaker or guest panellist at different international events, including ArchiLab 2002 (Orleans, France), Sensual City 2009 (Paris, France), Datum KL 2011 (Kuala Lumpur, Malaysia) and ISAIA 2012 (Gwangju, Korea). He moderated the Tsinghua Session in the 2012 Pritzker Beijing Architecture Forum. From 2014 to 2015, he was the director of Venue Planning and Sustainability in Beijing’s bid for the Winter Games 2022. Sophia Bai joined TeamMinus in 2013 and is now an associate of Atelier TeamMinus and assistant of Professor Li Brian Zhang. She is an expert in terms of small-scale architecture among the young emerging architects in China. Founded by Li Brian Zhang, TeamMinus started as a design research laboratory in 2001. In 2005, TeamMinus became a fully fledged architecture office. Today, there are around 50 people working in the office. Since 2005, TeamMinus has been involved in a series of chal-lenging projects, many of which have gained attention within China and from overseas. These projects range from large-scale event buildings to modest local facilities for culture and community. Throughout TeamMinus’ works, there is an underlying inquiry for an alternative modernity in China. Contemporary circulation space, either of a single building or a cluster of buildings, provides an opportunity for scaling down buildings. TeamMinus has been investigating this possibility in recent projects resulting in different yet related design strategies. In the Jianamani visitor centre, it is the 11 staircases leading up to the roof terrace. In Aranya Camp, it is the twisting, redundant ramp circling two courtyards. In Gujiaying Village Museum, it is the ripping open of the piazza ground. In the renovation of the Shougang oxygen factory, it is the lifting of new volume and the preserving of the old ground fabric. Born in Taiwan, Dr Andy Wen migrated to the United States with his family, where he later received his Master of Architecture degree from the University of Pennsylvania in 1990. He also received a PhD from Tsinghua University in 1999. Andy is now the Global Design Principal at Aedas. He has been working as a design architect for over 25 years with significant experience across sectors. He is in- volved in numerous projects including master planning, mixed-use developments, offices, high-end residences, five-star hotels, and education and cultural facilities. Andy also has a tremendous passion for architectural design as a scholar. He has taught at Ming Chuan University in Taiwan as the head of the architecture department and was a visiting professor of architectural design at Tsinghua University and China Central Academy of Fine Arts. He continued to develop his design philosophy during his years of teaching and further refined his design theories through a few renovation and expansion pro- jects of the campus buildings. As a design architect, Andy has contributed to many creative and iconic architecture projects which have won numerous international design awards such as the World Archi- tecture Festival Award, Asia Pacific Commercial Property Award and American Institute of Architects Award. There have always been elements of architecture within urban planning. However, architectural developments in China are enormously large in scale compared with western developments. Therefore, without considering ‘micro-urbanism’, cities in China today may result in ‘closed’ developments with low permeability, bringing problems such as traffic congestion, un-walkable cities and metropoles without character. Dr Andy Wen will demonstrate, with real-life examples and his new designs, how architects can address urban issues by introducing ‘micro-urbanism’. Born in 1972 in China, Hua Li received his B. Arch. from Tsinghua University in 1994. He then studied at Yale University and received his M. Arch. in 1999. He practised in New York and Beijing before founding TAO (Trace Architecture Office) in 2009. Hua Li visions architecture as an evolving organ-ism, being an inseparable whole with its environment, rather than just a formal object. With most pro-jects in China positioned in particular cultural and natural settings, his practice reflects the essence of place; make architecture deeply rooted in its cultural and environmental context with awareness of site history, geography and local condition. The sense of place, climate, topography, geology, local re-sources and construction method are crucial factors concerned and explored in every TAO project. Hua Li’s key works include: Museum of Handcraft Paper, XiaoQuan Elementary School, Wuyishan Bamboo Raft Factor, Forest Building, Split Courtyard House, TiensTiens Café, Lens Office Beijing and Xinzhai Coffee Manor. Hua Li and TAO have won several important architectural awards including the ARCASIA Award, Aga Kahn Award 2013 (shortlisted), BSI Swiss Architectural Award 2016 (nomi-nated), Architectural Record GDGB Award, China Architecture Media Award and WA Award, and TAO was listed in Design Vanguard 2012 by Architectural Record Magazine. TAO’s works have been ex-hibited internationally in Venice, Berlin, Vienna and New York. Hua Li also teaches at Tsinghua Uni-versity as a visiting professor and has been a guest critic for studio reviews at ETH, HKU, CAFA and UdK Berlin. He has given lectures in many universities and conferences in both Asia and Europe. Founded by Chinese architect Ma Yansong in 2004, MAD Architects is a global architecture firm com-mitted to developing futuristic, organic, technologically advanced designs that embody a contemporary interpretation of the Eastern affinity for nature. With its core design philosophy of Shanshui City – a vision for the city of the future based in the spiritual and emotional needs of residents – MAD endeavours to create a balance between humanity, the city and the environment. MAD has been commissioned by clients of various backgrounds to design mixed-use complexes, museums, theatres, social residences, renovations, artworks and urban plans. Mr Cui Kai was born in Beijing in 1957, and graduated from the Department of Architecture at Tianjin University in 1984 with a master’s degree. Now he is Honorary President and Chief Architect of China Architecture Design & Research Group, academician of the Chinese Academy of Engineering and founder of Land-based Rationalism D.R.C. He is also a bearer of numerous prizes, such as the Liang Sicheng Award (2007). He has also earned one gold medal, nine silver medals and five bronze med-als of National Best Engineering Design, Gold Award and Honorable Mention Award of ARCASIA， three Golden Prizes and 6 Silver Prizes of China Architectural Design Award, WA City Regeneration Award and so on. As a promoter of architectural academic research, Cui Kai also acts as the Vice President of the Architectural Society of China, Professor of Tianjin University, Practical Professor of Tsinghua University, Professor of University of Chinese Academy of Sciences and editorial board member of several architectural magazines. Wolfgang Frey is president of the Frey Architekten Group and founder of WFP Architekten, together with his partner Jiakun Wang. He has headed Frey Architekten since 1991. The architectural practice was founded in 1959 by Friedrich Frey and is located in the German eco-city of Freiburg im Breisgau. As one of the pioneers in sustainable architecture, Frey Architekten has been using solar panels since 1972. As a dynamic, sought-after architectural visionary, Wolfgang Frey has lectured at many famous universities around the world and won numerous architectural awards. In 2017, he was conferred with an honorary doctorate from the National University of Tumbes. The Frey Group nowadays encompasses multiple fields like urban planning, investment, project development, energy supply and community management. In addition, the office has an international presence in China, Russia and other parts of Europe. The origin of the passive house idea deals with the task of losing as little heat energy as possible by means of efficient building exterior insulation. The passive house is synonymous with progress, proven quality in the fabric of the building and sustainability – and that includes the clever use of all available resources. Double facades as a temperature regulator and energy producer used and applied together with balcony parapets with PV modules fulfil a double task: as fall protection and recovery of solar energy. With a ‘second shell’ in the form of canopies, balconies or so-called vertical gardens, these shading elements will protect the building from direct sunlight, reducing or even eliminating the need for additional indoor cooling. Green roofs also beautify the living environment and protect the building from overheating – and during cold days they prevent the building from cooling down by catching the wind. Such substitution achieves long-term economic viability. The use of such renewable energies also counteracts the waste of fossil fuels. Stephan Schütz, born in 1966, holds a Dipl.-Ing. Architect degree. He joined gmp · Architects von Gerkan, Marg and Partners in 1994 after completing his studies at the Technical University of Braunschweig. In 2002 he established the first Chinese gmp subsidiary in Beijing, which together with its offices in Shanghai and Shenzhen currently employs nearly 100 architects. In 2006 he was made a partner and oversees projects in China and Europe. Together with Meinhard von Gerkan, he developed the idea of transforming the soon-to-be-closed Tegel Airport in Berlin into a new ‘high-tech’ park. Though we usually spend more time in our workplace than anywhere else, the architectural and environmental quality of our world of work often seems to be of secondary importance. The industrial areas in the periphery of our cities bear witness to carelessness in a particularly frightening way. Some examples of completed projects in China might illustrate an alternative approach concerning industrial buildings. With more than 14 years of experience, Henry Lin has delivered industrial, retail, commercial, office fit-out and educational projects in all over the world for Colliers International. After obtaining his bache-lor’s degree in civil engineering at Chung-Hua University, Hisn-Tsu, Taiwan, he completed his master’s in business administration at Chung-Hua University and Texas A&M University, Texas, USA. Currently he leads a business unit at Colliers International to help customers achieve their expectations. Colliers International is an international and globally leading company in the project management industry. We have more than 25 years of project experience in China and have completed over 900 construction projects. Building Information Modelling (BIM) technology is now widely applied in the construction in-dustry and we also apply it in some of our projects. In past projects, this skill and tool was used for multiple project team members to enable them to get the latest project status and information from In-ternet. This means project managers can be geographically independent. It can save communication time and make work more efficient. Building Information Modelling (BIM) technology has been developed over many years in China. Currently it is applied to manage the design, time and cost for a construction project. Project managers usually use it to check if any conflicts have occurred between engineering disciplines, to calculate the material quantities and to manage the time schedule through the 4D model. Colliers International is one of the world-leading companies in this area and we have applied BIM technology in some of our projects. In the presentation, we will share our practical experience through a case study – Hexagon Intelligence Park project – to discuss the advantages and also suggestions to further improve the technology to better suit the local market. Johannes Kreissig received his master’s degree in mechanical engineering from the University of Stuttgart in 1993. He then worked as a research assistant and, from 1998 on, as the director of the Life Cycle Engineering department at the University of Stuttgart. From 2001 on, he was acting partner of thinkstep AG (formerly PE INTERNATIONAL AG). He developed thinksteps’ sustainable construc- tion business including Environmental Product Declarations (EPDs), green building certification ser- vices and construction materials databases. He has more than 25 years of experience in Life Cycle Assessment (LCA). Kreissig is a member of the German delegation to CEN TC 350 (sustainability of construction works). He had a significant influence on the development of the German EPD pro-gramme for construction products (IBU). Since 2014 he has been a member of the European Commis- sion’s Technical Advisory Board (TAB) for Product Environmental Footprint (PEF). In 2007 Kreissig was an initiator and founding member of the German Sustainable Building Council (DGNB). He served as a member of the board of directors until 2015. Between 2010 and 2016 he served as member ofthe board of directors for World GBC. Since 2016 Johannes has been the CEO of DGNB GmbH, and is responsible for DGNB certification and the DGNB Academy worldwide. The Paris agreement and frameworks such as the ‘2000 Watt Gesellschaft’ show clearly that all our buildings have to be carbon-neutral by 2050, which means at least zero carbon according to Scope 3 of the GHG protocol in operation. To reach this goal, additional processes will be established, including LCA at the early design stage, quality assurance during construction, and monitoring with optimisation during operation. The design focus will be on system optimisation using parameters such as the quality of the building envelope and the application of passive systems and high-efficiency technical equipment, as well as on-site production (PV). in 2006 and, in 2010, became Managing Director. Martin Reuter has extensive experience of all phases of the design process, from design to project implementation and administration. The main fo-cus of his activities is on international projects, specialising in large projects in Asia and Australia. The supergreen® aspect, which is a key focus of the ingenhoven architects practice, plays an important role in the design concept for all projects. Martin Reuter was responsible for the Marina One project in Singapore, which won the MIPIM Award in 2018, and for the development at 1 Bligh in Sydney - the only building in Australia to be awarded the Six-Star rating, the highest Australian rating under the Green Star scheme, and the 5-star NABERS energy rating. Martin Reuter is currently in charge of some of the practice’s large projects. Marina One in Singapore is to date the largest project by ingenhoven architects. As an international role model for living and working, Marina One makes an innovative contribution to the discourse on megacities, especially in tropical regions, which, in the context of increasing population and climate change, face enormous challenges. The high-density building complex with its mix of uses extends to over 400,000 square metres and, with its group of four high-rise buildings, defines the Green Heart – a public space extending over several stories. Partner and chief architect of RSAA GmbH. Learning from Bernard Tschumi and Kenneth Frampton, Ziyu Zhuang was awarded a Master’s degree in Architecture and Urban Design from Columbia University, USA. He founded the RSAA Beijing office together with several renowned German architects in 2010 after working many years in the Cesar Pelli New York office. Based in Beijing, Büro Ziyu Zhuang aims to use the connections from Germany and China to establish a new design vocabulary making use of the resources of both to create a new element of thought, a fusion of European and Chinese architecture. This creates a new and unique style which takes advantage of the dual Sino-European inputs, bringing Chinese influences to Europe and vice versa, crafting a new line of thought that surpasses the constraints of each individual culture. As a member of AIA and of LEED AP of USGBC, Ziyu Zhuang has been invited as a guest by universities, while frequently contributing to professional architecture magazines. Ziyu Zhuang has won several international design awards, including the Architizer A+ Award, Red Dot Award，IDEAT Future Award and Gold A’ Design Award and Iconic Award 2018: Innovative Architecture – Best of Best in 2018. The practice cases of RSAA / Büro Ziyu Zhuang in the context of contemporary Chinese society and spaces were using the extension of new narrativity and typology as motifs. Based on the design principles of the ‘Chinese narrative’, the studio deeply discussed and responded to the living habits, behaviour modes and cognitive characteristics of contemporary Chinese people. In this way, these projects are even more divorced from traditional Chinese forms and truly tell the story of contemporary Chinese architecture and space in the design.